When it comes to effortless weekday breakfasts, granola tops the list. You can basically roll out of bed, pour some granola into a bowl, and be off to the races in seconds flat. And when you love sleep (like we do), that’s often exactly what you need in the morning. While store-bought granola works in a pinch, most brands are stuffed full of sugar - or at the very least, cost far more than you should ever be spending on a bag of oats. So do yourself a favor and bake it yo’self. 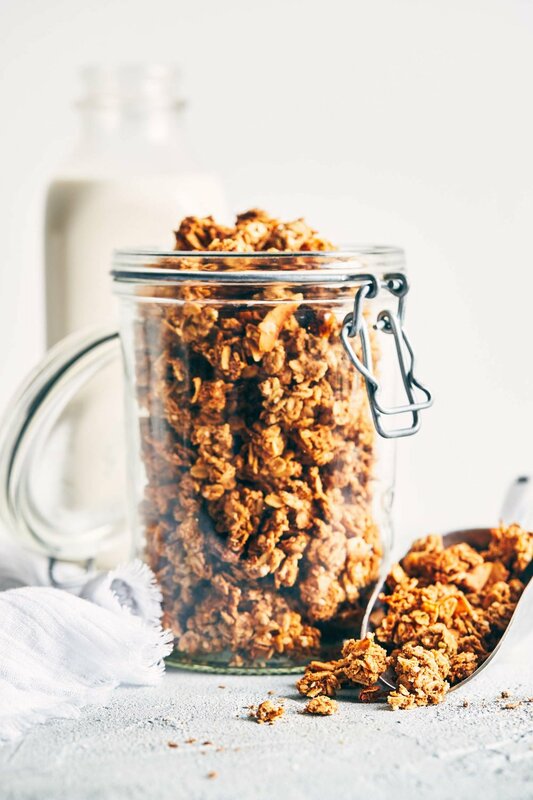 Over the years we’ve cycled through a number of different homemade granola recipes, but this one has remained our favorite. The granola clumps up without any high maintenance steps, it’s just sweet enough, and is packed with extra protein to keep you satisfied throughout the morning. Most of this is thanks to the almond butter “caramel” that brings it all together. But let’s also not forget that this granola is the perfect vehicle for using up your leftover nut pulp. And if you’ve ever made nut milk before, you know how magical that is...given it can be pretty tricky to find a delicious way to us that stuff up. We’re trying to be more diligent about making our nut milks on a weekly basis. Things have gotten really busy around here, and as a result we’d been resorting to store bought cartons out of sheer convenience. But we’re increasingly aware of all the excess packaging it creates. And when homemade nut milks taste a million times better and involve less than five minutes of your time, the “convenience” benefits of store-bought can be hard to justify. So we’re getting back to making it from scratch more consistently. And that means lots and lots of Easy Nut Pulp Granola. For convenience, this recipe calls for one cup of nut pulp. In other words, you need exactly what’s left over after making a classic almond milk recipe (i.e. ratio of 1 cup nuts to 4 cups of water). There’s no need to save up the pulp, because speaking from experience, that usually leads to a forgotten bag of nut pulp shoved into the depths of the freezer. One that usually only emerges months later covered with freezer burn. So just skip the hassle and whip up a batch of granola after you’re done making your nut milk. It’s the perfect Sunday activity, and you’ll be thanking yourself all week. While the nut pulp most definitely helps with the clumping of the granola, the almond butter caramel is the “glue” that holds everything together. It’s primarily made of four ingredients: coconut oil, coconut sugar, brown rice syrup, and almond butter. Brown rice syrup is a vegan alternative to honey, and its stickiness helps the granola clump. You can find brown rice syrup at almost any grocery store, either in the health foods aisle or near the sweeteners. We haven’t tested this recipe with any brown rice syrup substitutes, but if you absolutely must, try honey instead. You’ll end up with a sweeter granola since honey is one-third more sweet than brown rice syrup. We’ve tucked some hemp seeds in the mix, which we love for their healthy fats (like omega-3), but you can omit them if you wish. Enjoy this granola as breakfast or a snack. We usually eat it with the nutmilk we’ve made, but it also tastes great as a topper in fruit & yogurt bowls - or simply by the palmful if you want a midday snack. This granola also makes a yummy and thoughtful gift to friends and family. But if you go this route, do be prepared to share the recipe. We’ve yet to have someone try this granola and not ask for it, so consider yourself warned! Preheat oven to 275°F. Line two baking sheet with parchment paper and set aside. Combine rolled oats, almond pulp and hemp seeds in a large bowl. Stir to mix. In a small saucepan, combine coconut oil, brown rice syrup, coconut sugar, almond butter, vanilla extract and salt. Transfer to stove and heat on low, stirring regularly. As soon as the “almond butter caramel” is warm and smooth, pour it over top of dry ingredients. Use a spatula to combine, working quickly to incorporate (much like if you were making rice crispy squares). Add coconut flakes and stir to mix. Divide mixture evenly onto parchment lined baking sheets. Bake granola for 50-60 minutes, or until golden brown. For even browning, rotate pans half-way through. Remove from oven and let fully cool before transferring to sealed container. *Leftover from making homemade nut milk. If you follow the standard 1 cup nuts to 4 cups water ratio, use all the pulp that remains in the nut milk bag.